LiveRez partner All Star Vacation Homes will be featured on an episode of HGTV's "House Hunters" tonight (June 12) at 10 p.m. EST/PST. LiveRez partner All Star Vacation Homes will be featured on an episode of HGTV's "House Hunters" tonight (June 12) at 10 p.m. EST/PST. Check your local listings for the exact broadcast time in your area. This particular episode will be based on a family shopping for a vacation home in Orlando, FL that they plan on putting into a rental program after purchasing. During the episode, Dillon Muto, Broker Associate with All Star Vacation Home Realty and Chief Operating Officer of Purpose Built Vacation Homes™, will take the family on tours of multiple All Star homes including the 9-bedroom, 9.5-bathroom Purpose Built vacation home at 1105 Watson Ct.
Greg, Wendy and their three young girls are ready to escape the snow in Manitoba, Canada, and buy a vacation home near Universal Studios in Orlando, Florida. With a million dollar budget, they're looking for a home with all the bells and whistles; something near the theme park with a pool, a theater room, and plenty of guest rooms for all their relatives. But with their long wishlist, this house hunt may turn out to be more work than vacation. 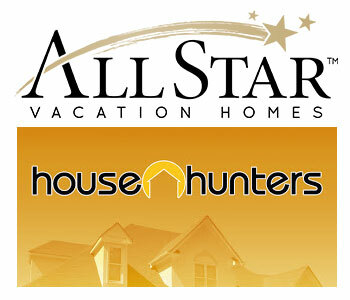 All Star Vacation Homes' appearance on HGTV will be the second for a LiveRez partner in the last year. Casas de Santa Fe was featured on HGTV"s "House Hunters on Vacation" in June 2012. For more information on tonight's episode, check out the All Star Vacation Homes blog.